Afghanistan, a magnificent land of wild mountainous beauty, once a haven of shepherds, flutists and weavers. Their land is their faith. Their faith is their strength. Their strength will forever be deadly to invaders. Compassion is a taboo word in current transnational politics. But an understanding of compassion is all we need to see why wars in Afghanistan are never won. If the truth is that simple, why do we need think tanks to fabricate tomes of imperial strategy? Why do we need political analysts to untangle the lies of the warhawks? Because the liars mint the language, and the language they’ve minted forbids the word compassion. And when compassion is absent from the language, truth is obscured. That said, the folly of invading Afghanistan should be obvious to every child. The egregious immorality and arrogance of harboring imperial ambitions in Afghanistan should be clear to every church-goer on Sunday. It is certainly clear to President Donald J. Trump, who announced in a speech (transcript and video here) on August 21 an increase in US troops to the region and an indefinite continuance of American occupation. What is driving Trump’s escalation in Afghanistan? As evident in his national address, Trump’s rationale for sending more troops is not only an obvious fairy tale, it runs counter to everything Trump claimed to believe about the folly of US intervention. The conclusion is that Trump has fallen victim to deep state pressure. This will be analyzed further below. Chossudovsky, scholar and resident of Canada, reveals his anti-American bias by blaming the destruction of Afghanistan wholly on the US and its allies, ignoring the damage caused by Soviet forces in the war of 1979-1989. This renders him suspect in other claims, in particular the accusation that Trump seeks to “plunder and steal” mineral resources. Chossudovsky tends to exaggerate the vilification of Trump and America, as will be examined again below. So can we believe him? 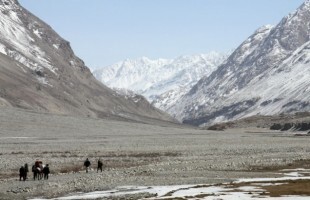 While Trump may hope for some economic boost to Afghanistan’s government through extraction of the land’s mineral resources, it is doubtful this is the main objective for extending the US war. 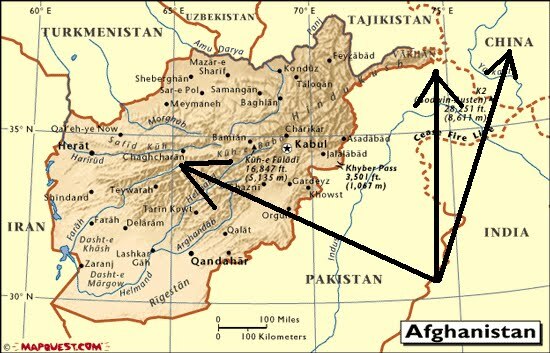 Athough Downs’s report corroborates China’s large-scale investment Afghan resources, the author seems to suggest that if the U.S. wants to curb Chinese exploitation, it might be better off withdrawing troops rather than increasing them. 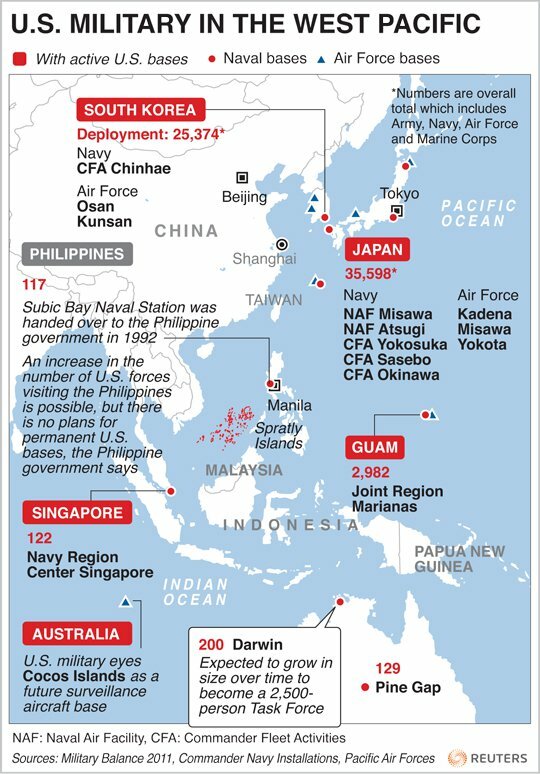 This runs counter to the notion that the deep state’s motive for sending more forces is to limit China’s influence. Of course, containment of Chinese expansion would always be a secondary motive in any Western intervention in the region. But is it a primary motive? Probably not. It is easy to be suspicious of the corporate interests of companies like Academi. These war profiteers certainly play a role in the decisions of the deep state hawks. But it seems doubtful this is the main driving force for Afghan intervention. Unfortunately, Plotov gives no references for this claim, and again, he is publishing in a biased anti-American journal. Let me explain what I mean by “anti-American”. I do not mean these websites are simply critical of American foreign policy. After all, no news site could condemn US intervention more vehemently than Quemado Institute (see our post Afghanistan Afterthoughts: What Cauldron of Hell is the US Stirring?). What I mean by anti-American is that a site’s authors speculate, often without evidence, fantastic scenarios that vilify US actions, and in particular, that vilified Donald Trump even before he took office, when for all anyone knew, Donald Trump was an anti-interventionist candidate. This contradiction points to a strong liberal bias. New Eastern Outlook, Global Research and Information Clearing House, all mainly scholarly sites, share this liberal bias, which unfortunately pits liberal anti-interventionists against conservative anti-interventionists, thus dividing the anti-interventionist camp, to the benefit, alas, of the neoconservative ruling establishment. Is This a “Humanitarian” War? When an entity, be it a person, organization or country, intervenes without permission in someone else’s affairs, intending to kill certain people in order to save others, I maintain as a moral rule that they are playing God, and a priori have no right to interfere. That said, can we evaluate whether continued US occupation of Afghanistan is humanitarian or constructive for the people living there. Search as I might, I have not found conclusive evidence either way. (If any reader knows, please comment.) Here I am not referring to the 100,000 maximum US troop level reached under Obama—which was egregiously inhumane and damaging to the country—but to the roughly 12,000 to 16,000 troop level projected under Trump’s occupation. As a preliminary condition, it is not humanitarian to support the Afghan government unless it is worthy of governing and welcomes our support. It is unclear to me whether the Afghan government under President Ashraf Ghanihas weldomes an increase in US military presence, and it is not even clear whether Ghanihas represents the majority of the Afghan people. It would be noble, of course, to remove the Taliban from power, as they are brutal and authoritarian, especially in their subjugation of women, a condition unacceptable anywhere on earth. But at what cost in terms of human life? Interventionists cannot possibly know the answer. Which is exactly why they should not intervene, even if compassion were a word in their minted language. Byman may not have intended the glaring implications here. That the Afghan military is reluctant to fight does not mean the US should go in for humanitarian purposes and help them. Just the opposite. That they don’t want to fight is a sure sign there is something wrong with the war. Consider, for example, the fact that when the United States first invaded Iraq in 1990, American troops were perplexed and disconcerted that the Kuwaiti soldiers did not want to help them fight. The reason may have been that the war was launched on false premises. Saddam Hussein did not attack Kuwait for imperial gain. He attacked because Kuwait was stealing his oil via horizontal drilling. So if the locals don’t want to fight, there just might be a good reason. Another case is Ukraine, where morale is low among the Ukrainian Army. The troops are reluctant to fight because they know they are killing their own people. Americans in Vietnam suffered the same demoralization, because they were massacring civilians without purpose. First, was this NGO sponsored by the CIA, or was it local? If the latter, Dasgupta may have a point. 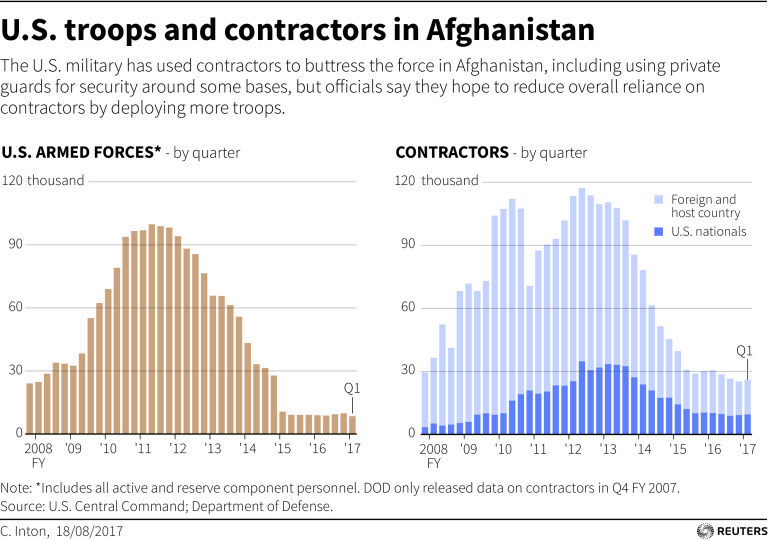 But that was in 2009, when American GI’s numbered about 32,000 (see chart above) and private American contractors about 7,000. The conversation occurred right before the Obama troop surge of 2010-2011, in which the total jumped to some 115,000. The numbers today are roughly 10,000 in each category, lower than 2009. Would Dasgupta want additional troops now after witnessing the destruction of Obama’s surge? Click to enlarge. 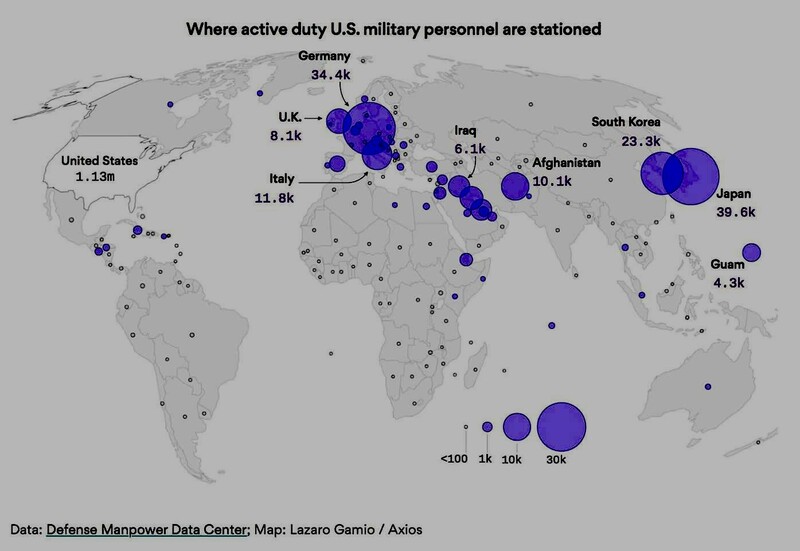 US troops abroad. While these statements may be vague, Mattis’s words seem far more sober than the rabid rhetoric of hawks like John McCain. Mattis’s statement is a ticket to protracted occupation on an unlimited time-scale. And since Mattis may be controlling Trump’s mind, it seems the hope of US non-intervention has now become a mirage. This 9/11 Bin Laden fairy tale just one of Trump’s and Mattis’s lies. To elucidate all their lies would be tedious. What we might as well conclude is, their rhetoric is that of imperialists. 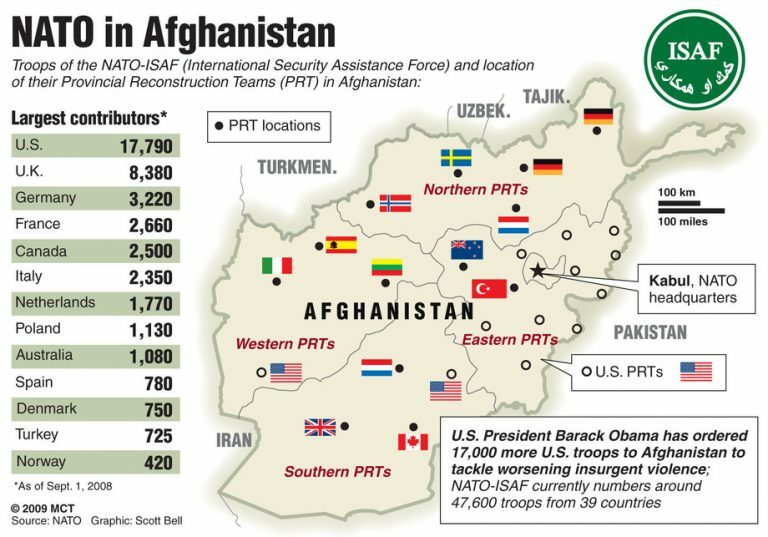 There is no motive for extended occupation of Afghanistan other than that the United States government, the governments of its allies, Western corporate elites, and the military-industrial establishment seek total control over the world. Control for the sake of control, as control becomes a runaway obsession for those bent on eradicating all threat. What Drives Trump’s Appeasement of the Warhawks? Analysts have dissected Donald Trump’s seemingly unfathomable psyche in myriad commentaries without consensus. Such dissections are actually projections of the analyst’s own psyche. I project that Trump is bright enough to see the importance of being straightforward. His motives are therefore transparent. 1) Trump has become a puppet of the deep state because he is probably afraid of being assassinated. Trump is willing to risk his life, but not if the risk is 100%. His reticence to leap willy nilly into the realm of spirit is not entirely self-serving. If Trump were to perish, Vice President Mike Pence, diehard neoconservative warmonger with a documented history, would become president. This is a possibility, but not an option. 2) Trump has become a puppet of the deep state because the corporate media tortured him psychologically with relentless lies and slanderous accusations, many of which went unrefuted by insouciant liberal alternate media pundits, who favored Bernie Sanders, although his seldom revealed foreign policy was in fact neoconservative, as Quemado Institute has proven (see conclusion, War on Assad Spells Naked US Aggression). How much mental torture can an individual endure and retain integrity? Probably not as much as Trump has had to endure. 3) Trump has become a puppet of the deep state partly because most of the anti-war alternate media hypocrites vilified him to death. The very folks who should have fought tooth and nail to defend him against the liberal neocon left ridiculed him at their leisure, as if they could afford to risk the fate of the world, upon which they apparently thought they had no influence. As if Trump could afford emotionally to endure such hatred from the very people whose concerns he was trying to address. As if Trump were not a human being, with all the vulnerabilities of a human being who is not a professional politician. The very same commentators who hated the deep state also inexplicably hated Trump, even though Trump himself hated the deep state and was willing to risk his life to fight against it. Fight against it for our sake. Even though he was the only hope in the world for countering the deep state other than Russian President Vladimir Putin. Consistently and viciously F. William Engdahl, touted geopolitical expert of New Eastern Outlook and all the authors he posted. 4) Trump has become a puppet of the deep state because, in order to prevent impeachment or assassination, he erected a fortress of Marine Generals to guard him, a gambit prolonging his presidency but incurring the risk of a de facto military executive takeover, which may have already happened. 5) Trump has become a puppet of the deep state because he fired his loyal defenders, Mark Flynn and Steve Bannon, apparently because Trump, in his toddler stage as a Washington politician, thought this would appease the throat-slashing neck-biting congressional and media hyenas from which Flynn and Bannon were trying to protect him, leaving Trump wide open to the fangs of the military-industrial warhawks. 6) Trump has become a puppet of the deep state because of his exposure to pro-Israel and Zionist influence after years of financial dealings in New York City, as well as his vulnerability to his daughter Ivanka’s wishes and her husband Jared Kushner’s nepotist interference in presidential decisions. 7) Trump has become a puppet of the deep state because he has lost his way. He has lost his way because he is idealistic and politically inexperienced—in other words, he’s just like the rest of us. And who among his former alternate media supporters is reaching out to help him? Russia Insider? Paul Craig Roberts? Alexander Mercouris of The Duran? 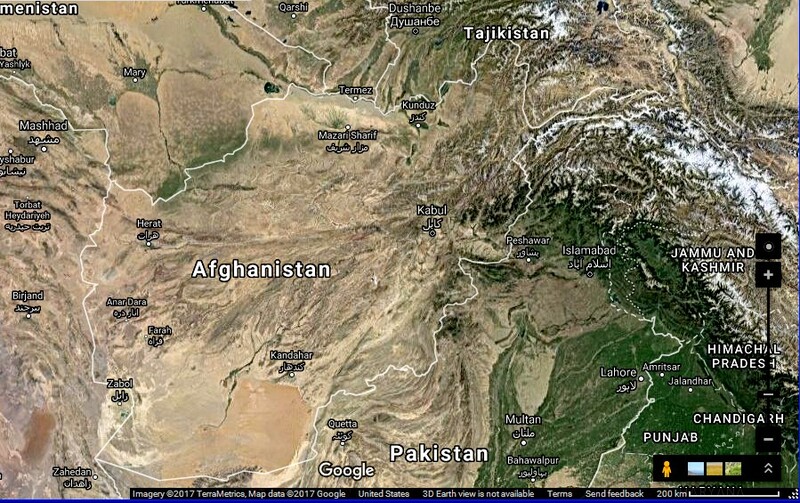 « Afghanistan Afterthoughts: What Cauldron of Hell Is the US Stirring?